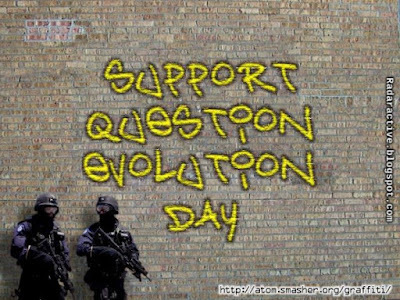 The secular science industry is conveniently providing illustrations of the need for Question Evolution Day, and are providing them in a big way. Mighty obliging of them. Although science is supposed to be the search for knowledge, the word science is equated with vertical evolution, and contrary views are not only discouraged, but actively suppressed. A paper was recalled because the authors had the audacity to use the word creator. Evolutionists bushwhacked Mary Schweitzer because of her work on dinosaur soft tissues. Darwin deniers are harassed and even fired because of their views, not because of their job performance. Have you noticed that logic and critical thinking are actively discouraged instead of taught in schools nowadays? Bullying and ridicule from Darwin's microcephalic children ensue, again equating evolution with science and inferring that creationists are bad people with "agendas". Yet, secularists have agendas, and seek to protect their death cult of evolutionism from scrutiny. Their double standards include allowing bullying of Christians and creationists because we "deserve it", as I've seen a few tinhorns say. Some will even reflexively call us "liars" because they dislike (or do not understand) evidence we present. Those actions are nothing less than unabashed bigotry, old son. What really takes the rag off the bush is when a minor government official in India apparently not only doubted Darwin, but misrepresented it. Circle the wagons! Someone did not kneel before Darwin, blessed be! The outcry in India is actually funny in some ways, but it clearly illustrates the desperation of Darwinoids. Instead of telling the man that he said something wrong, and instead of responding rationally with the true spirit of science, people went plumb loco. This is what thinking people are up against. And some try to tell us that evolutionism and atheism are not religions? Wouldn't it be nice if they were honest for once? Secularists have repeatedly shown that they do not believe in intellectual, academic, professional, speech, religious, and other freedoms. And it is escalating. There’s no escape. You can’t flee anywhere in the world if you doubt Darwin. Look at this headline in Nature News: “Anti-Darwin comments in India outrage scientists.” It doesn’t say that scientists (defined here as members of Nature's opinion of acceptable materialists who pay homage to Darwin) merely “disagree” with the comments. It doesn’t say that they feel such comments are misinformed. No; Nature reporter T. V. Padma says the comments 'outrage' scientists (scream when you say that!). The word implies hate, intolerance, and mob psychology. The subtitle is even more disturbing: “Researchers and government officials have condemned the statements of a junior minister who questioned the theory of evolution.” The priests of Darwin want to send this minister to materialist hell for the unpardonable sin! 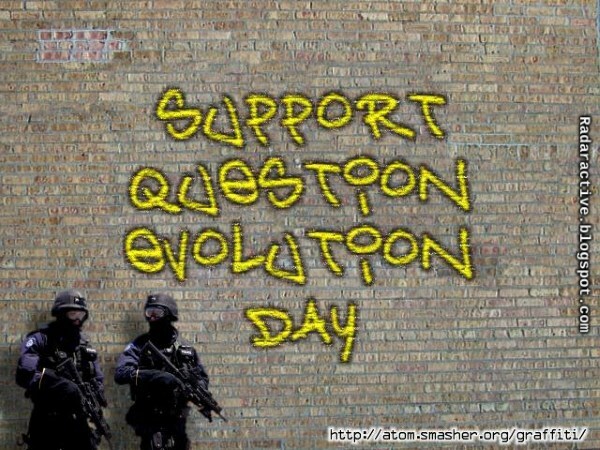 To read the rest, click on "Big Science Condemns Blasphemy Against Darwin".